Iron is a mineral that naturally exists in water. The erosion of pool equipment adds iron to your pool, which affects the water quality. Corrosion occurs over time and is expedited by high chlorine and low pH levels. An overabundance of iron in pool water shows itself in the form of cloudiness and red, brown, black, gray or green staining. Remove iron from your swimming pool water quickly to save yourself time and money in the long run. Remove copper as soon as possible to reduce the amount of time and money you will spend on removal later. Test the water with an iron test kit to ensure that iron is indeed a problem factor in your pool. Iron present at 0.2 parts per million (PPM) is enough to cause staining and clouding. Take a sample of your water to your local pool supply store for iron testing if you prefer. Add shock, which comes in chlorine and non-chlorine types, to your pool and follow up with a treatment of clarifier to reduce the look of iron buildup. Make sure you use shock appropriate for your pool type. Vinyl pools require a different shock than gunite pools. Follow the directions on the shock label. Typically, you will run your pool for 6 to 8 hours during the shock treatment. Shock destroys harmful contaminants in your pool water. Scrub the sides of your pool during this time to loosen iron stuck to the pool walls. Remove the iron by adding a flocculent. The flocculent will attach itself to the iron and pull it to the bottom of the pool. Backwash the filter before adding the flocculent. Follow the directions on the bottle. Add one quarter of a gallon of flocculent for every 6,500 gallons of pool water. Vacuum the pool to remove the iron that has been pulled to the bottom. 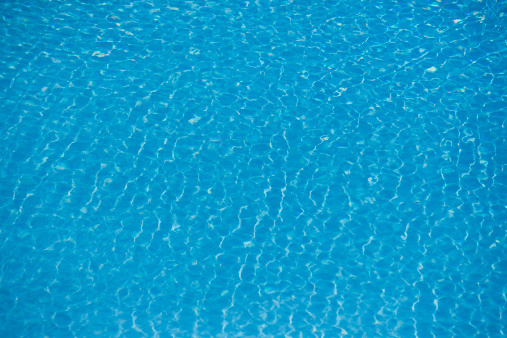 Maintain your pool's pH level between 7.2 and 7.6. Doing so will remove and prevent iron stains. Test kits can be purchased at your local pool supply store. Test your pool's pH level weekly and adjust by adding pH up or down to adjust. Conduct a partial water change when iron levels are above 0.5 PPM.